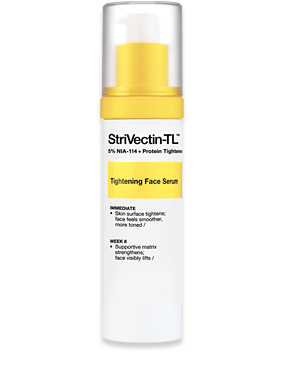 StriVectin is a clinically-proven, scientific skincare line, that offers comprehensive anti-aging solutions to women (and men) around the world. Whether it’s wrinkles, loss of firmness, skin damage, age spots or a complexion in need of brightening, we deliver. Only our formulas have our patented, proven NIA-114™ molecule (Niacin) that powers up skin to repair damage and fight off all visible signs of aging for a healthy-looking, ageless appearance. And, with ageless skin comes newfound confidence, feeling renewed and compliments. Only StriVectin formulas have the patented, clinically proven NIA-114 molecule, discovered in skin cancer research to help rebuild the skin barrier. NIA-114 powers up skin to help repair damage and fight off all visible signs of aging for a youthful look and feel. To target specific skin-aging concerns, we combine the NIA-114 molecule with proven, technologically advanced age-fighting actives. StriVectin formulas help fight off all visible signs of aging. So whether it’s wrinkles, loss of firmness, age spots or skin damage, StriVectin’s supercharged formulas add up to healthy, ageless skin. I was sent samples of StriVectin products to review. 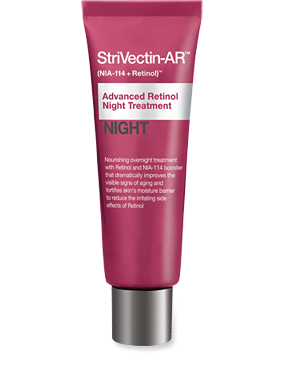 I received StriVectin-TL™ Tightening Face Serum and StriVectin-AR™ Advanced Retinol Night Treatment. Lightweight yet powerful serum delivers a potent dose of instant toning. Tightens, firms and returns youthful face contour. See more lift with our exclusive Three-Tiered Technology that works from within, first tightening skin’s surface, then fortifying the skin matrix. Finally, NIA-114™ strengthens skin’s ability to hold natural collagen. So skin looks lifted, firmer – more youthful. My Experience: I could feel the tightening sensation almost as soon as I applied this fabulous serum. It makes my skin look so beautiful and flawess. It is lightweight enough so that I can wear it under my daily foundation without any greasiness. It makes my skin look so smooth, as well as line free. I love it! Faster, smarter anti-aging. Our breakthrough formula improves the look of deep-set wrinkles, firmness, skin tone, texture and radiance. While you sleep, it hydrates and deeply nourishes your skin. And, working as a dynamic duo, our patented, NIA-114™ molecule activates Retinol’s age-fighting power to work harder, faster, more efficiently without irritation. My Experience: I use this at night after cleansing before I apply my nightime moisturizer. I do not have any deep wrinkles as of yet, but by using this amazing night time retinol cream, you can bet I will not be getting any wrinkles any time soon, as this formula is at work repairing my skin as I sleep. Upon wakening, my skin is unbeleivably soft and supple. It looks renewed and refreshed as well as dewey, but not greasy, so I know that the product has fully absorbed into my skin. I love it! 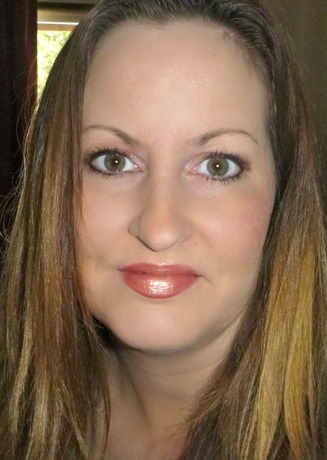 I love StriVectin anti-aging products because of how my skin looks and feels after I use it!